Today, the queen (yes, the actual queen of England) made her first-ever visit to London Fashion Week, making a surprise visit to watch emerging designer Richard Quinn. Her Majesty sat in the front row in between Anna Wintour and Caroline Rush from the British Fashion Council to watch the show and then presented the designer with the inaugural Queen Elizabeth II Award for British Design. This was the 91-year-old monarch's first fashion show, and she perfected the front-row fashion face (see below) while wearing the colour that has dominated the catwalks this season—blue. The hue was one of the standout trends for A/W 18, as we saw it everywhere from Emilia Wickstead to Delpozo. 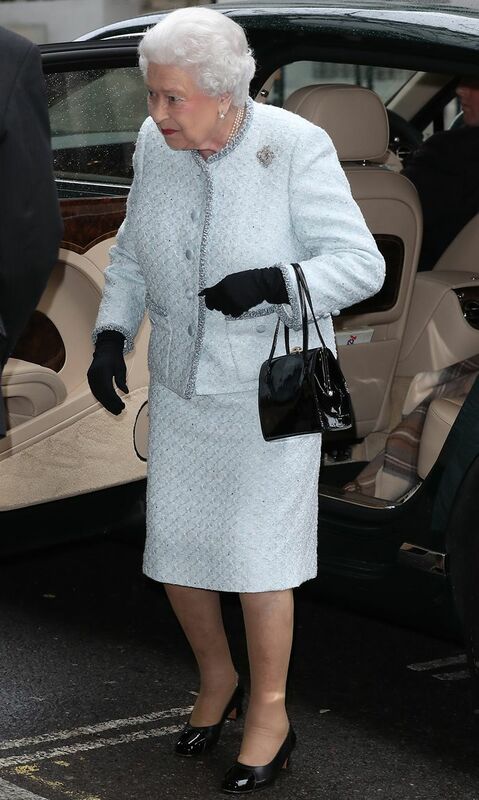 The queen wore her blue tweed skirt suit by Angela Kelly with black gloves, black block heels and a top-handle bag from Launer. The pictures of her exiting her Bentley just changed the street style game forever. Keep scrolling to see the pictures of the most iconic front row of all time.